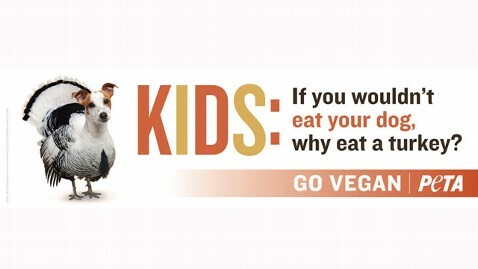 PETA to Kids: Would You ‘Eat Your Dog’ For Thanksgiving? PETA, the animal rights organization that thrives on over-the-top controversial ad campaigns, is now inviting children to consider that eating a turkey on Thanksgiving is the same as dining on your dog. PETA plans to erect numerous billboards of this ad near public schools in major cities in Nebraska, Oklahoma, Oregon, Florida, New Mexico, Utah and Tennessee, to “spark a dialogue between kids and their parents,” according to Byrne. However, PETA is still negotiating with local advertising companies in various cities. The organization launched the campaign, Byrne said, to raise awareness that much like man’s best friend, turkeys are also animals that are sensitive to pain. “It doesn’t make sense to call dogs our friends and turkeys our food,” Byrne said. In addition to the billboards, PETA also suggests turkey substitutes for a traditional bird, including the soy-based Tofurkey, as well as other soy-based recipes on their website. This isn’t the first time PETA has used the Thanksgiving holiday as a soap box for turkey cruelty. In 2009, the organization released an ad called “Grace,” which featured a little girl leading her family in prayer over their Thanksgiving meal and then suddenly launching into a graphic description of how turkeys are slaughtered as her family shifts uncomfortably in their chairs.